Witcher Vision is pretty cool. At any given moment, you can hold down a button to put Geralt’s field of vision into a sort of detective mode. This lets him see footprints, clues, key items, and the like. In practice, sleuthing around various environments—be they houses, dilapidated beach huts, or seemingly inconspicuous forests—isn’t very challenging, but it adds a lot to the feeling of being a Witcher. All I could do was release a heavy sign and massage my temples. “Detective vision” and its equivalents has never been good game design in any game I have ever played, for one specific reason: there is hardly any incentive to ever turn it off. Games with detective vision usually have hidden treasures and/or secret doors that are only visible in detective mode. This makes sense in a twisted-logic way, as why have detective vision at all if you can only use it in certain prescribed areas? That is basically “Press B to solve puzzle.” Of course, you don’t want to give players an ability that’s completely useless outside of specific zones either, for the same reason you don’t craft an elaborate cave complex with no treasure chest at the end. That’s just frustrating. But the end result is that designers hide invisible things throughout the game because they feel they have to, and then the players end up spending the entire game with detective vision active so as to not miss these invisible things. Which means not only is nothing of use being accomplished (the actions cancel each other out), the player ends up spending the entire game in a sepia-colored wasteland devoid of all detail or immersion. The bad guys may as well not even have character models. 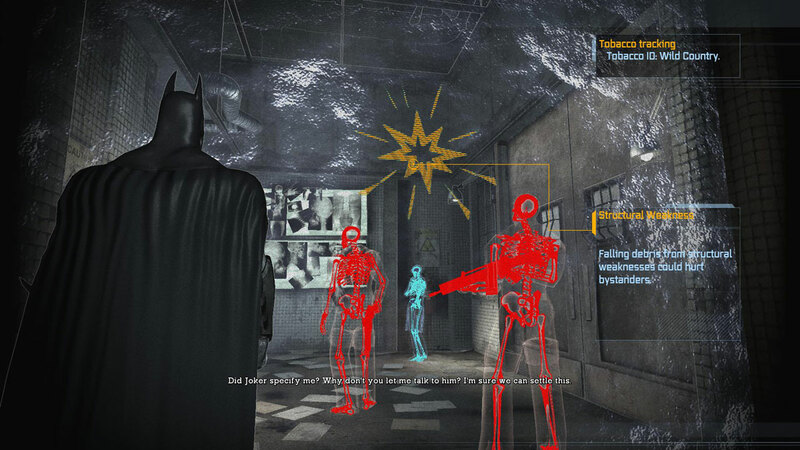 Case in point: Batman Arkham Asylum. Played and beat it a few months ago, but I couldn’t even really tell you how the game looked, because I was in X-Ray vision nearly the whole damn time. Case in point: Dishonored. The Dark Vision spell is an early upgrade that trivializes even the highest difficulty, no-kill runs. Beautiful game environments reduced to sepia-colored vomit for the whole rest of the game. Hell, I didn’t even like the scan mechanic all the way back in the first Metroid Prime game for these same reasons. I just ran around trying to scan every damn thing, just in case. Around 90% of the time, your screen will look like this. I honestly see no good solutions for this design issue. Even if you limit the player when they’re using detective vision (e.g. not letting them attack, or perhaps even move) that doesn’t stop players from feeling like they need to be utilizing it at every opportunity. Only allowing detective vision to be useable when there is something to detect is kinda asinine; why bother including it at all? None of the solutions feel particularly good. One might think that the “search pulse” ability featured in Dragon Age: Inquisition, the original Witcher games, and many others might be better, but… I spend the whole damn game spamming those keys already. Same deal with the Battlefield series and PlanetSide 2, in spamming Q to spot enemies that I don’t actually see, but could be out there somewhere near my crosshairs. Sometimes it saves your life; there’s no reason not to. This might well be one of those scenarios in which the “old school” solution of just making hidden things hard to find is best. At the same time, I don’t necessarily want to go back to the days of having to tab out and hit GameFAQs when I can’t find the pixels the designers wanted me to click on either. If I had to choose though, I would rather miss hidden treasure because I was too immersed in the game environment than miss it because I took a break from the otherwise permanent Instagram filters. Posted on January 27, 2015, in Philosophy and tagged Detective Vision, Dishonored, Game Design, Sepia, The Witcher. Bookmark the permalink. 6 Comments. How about if the “Detective Vision” was a manageable resource? You could use it anywhere but it would only last a short time and take a long time to refresh. Very easy to come up with in-game reasons for that. Then deciding when to use it would become a significant factor – you couldn’t just have it on 90% of the time or even 10%. Another solution, and a much better one, would be to remove the visual factor and replace it with an audio trigger. Audio is unbelievably underutilized in nearly all games and this is one of many examples of how sound could do a much better job than vision. Instead of the annoying visual effect The Witcher could have a mental tug that expresses itself as a wordless whisper that becomes louder or clearer the nearer he gets to a clue or a hidden object, which would then reveal itself at a given proximity. In a more technological setting that could be a device that pings location audibly or an autonomic assistant that relays the specific information. etc etc. Of course all those weird people who play games with the sound off while listening to their own music or half-watching tv shows would miss out but that’s their problem! I don’t like the recharge idea, as without some sort of indication that detective vision would be useful at a particular location, it would simply be very frustrating. Sort of like how old-school games would hide things in places that no sane individual would ever check, presumably to sell strategy guides. You are right though, that games don’t use sound enough. It’s probably as you describe though: devs are worried that players might be muting the game, or otherwise not have the volume turned up loud enough. Which seems goofy at first, until I remember when I was still playing games in the family living room, dorm rooms, and other places that I didn’t want to necessarily take over, aurally. It sounds like a souped-up version of Dragon Age: Inquisition’s search button too, which I think is one of the worst design decisions in recent memory. I am with you: I hate this kind of thing. Why go to such great lengths to make an interesting world filled with clues, puzzles, quests, and adventure if you are just going to hide it behind some arbitrary and frustrating button press? It adds a net negative to the experience, if it adds anything at all! Add another vote for the ‘just hide it old-school’ option. Perhaps with one of those quaint ‘you’ve found x secret areas so far’ counts or ‘sense of mystery’ meter to let you know whether or not to keep looking. It does require being able to live with simply missing some things, though. I don’t see how one can enjoy the satisfaction of being clever (or even lucky) enough to find hidden content without the possibility of failure at it, as with any game system. I would be completely satisfied with those alternatives. It’s kinda funny actually, as I am not normally a person who cares about achievements or hitting 100% or whatever. There is a difference in my mind though, between forgoing looking into every nook and cranny for hidden pixels and the active decision to not leave detective vision on. The latter feels… unacceptable. Sub-optimal. It’s a “small price to pay” leaving up the sepia-filter, but it adds up over the course of the game. Or how about just making it more context sensitive or less aesthetically overbearing? Sure, highlight NPCs that are behind walls so that we know they’re there, but when they come into view, there’s not exactly any more need to coat them bright blue or yellow. 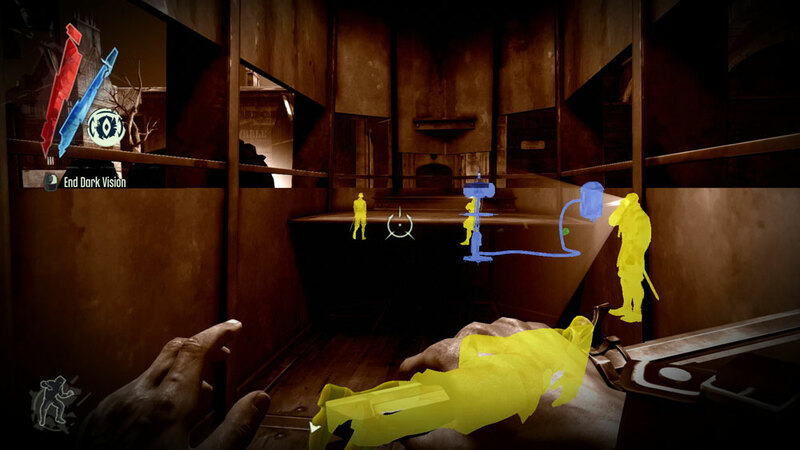 I seem to recall Left 4 Dead doing this with player models, you could see where your allies were beyond the walls, but they went back to normal once within your field of vision. Or put a thin yellow outline to indicate NPCs and items of interest, so you don’t obscure everything else.